Vintage Lee Brooklyn Denim Mens Jeans 26 in. 44 in. Lee Luke Slim Tapered Vintage Denim Jeans 26 in. to 44 in. VINTAGE LEE BROOKLYN LIGHTWEIGHT CHINO JEANS GRADE A 29 in. to 44 in. Lee Denver Mens Vintage Flared Leg Jeans 26 in. to . 44 in. Lee Dillon - Loose Boot Vintage Denim Mens Jeans 26 in. to . 44 in. Lee Seattle - Regular Straight Vintage Denim Mens Jeans 26 in. to . 44 in. Lee Powell Slim Vintage Denim Jeans 26 in. to 44 in. Vintage Lee Knox Mens Denim Regular Straight Leg Jeans 26 in. to . 44 in. LEE BROOKLYN LIGHT WEIGHT VINTAGE JEANS GRADE A 29 in. to 44 in. Jeans & Denim. Coats & Jackets. The item you receive will be a unique piece of history. Lee Nash Mens Denim Classic Fit Vintage Jeans 26 in. to . 44 in. Beige - J4038. Jeans & Denim. Casual Wear,party wear,Celebrity Inspired. The item you receive will be a unique piece of history. Jeans & Trousers. Good quality denim jean dungaree playsuit. UK Size 6-8 8-10 10-12 14 16. Jeans & Denim. Waistcoats & Gilets. Coats & Jackets. The item you receive will be a unique piece of history. Cleaned and ready to wear. Lee mid blue relaxed fit bootcut jeans. Jeans & Trousers. Waist: 32". Condition : Excellent. Coats & Jackets. Waistcoats & Gilets. Sports Shirts. Jumpers & Cardigans. 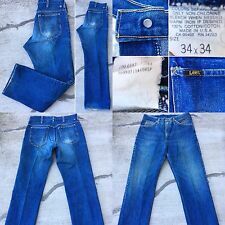 Lee mid blue straight leg jeans. Jeans & Trousers. Waist: 34". Condition : Excellent. Coats & Jackets. Waistcoats & Gilets. Sports Shirts. Jumpers & Cardigans. Lee light blue straight leg jeans. Jeans & Trousers. Colour: Light Blue. Inner Leg Length: 30". Prices are based on the weight of the order. Waist: 31". Condition : Excellent. Shorts & Joggers. Beige - J4038. Jeans & Denim. The item you receive will be a unique piece of history. Waistcoats & Gilets. Coats & Jackets. One of a kind item get it before it's gone! Cleaned and ready to wear. Zip fly fastening. Size : W30 L28. Jeans & Trousers. Colour: Dark Blue. Prices are based on the weight of the order. Condition : Excellent. Fly Type: Zip. Jumpers & Cardigans. Blue Lee Cooper W30" L34" Straight leg, Vintage Denim Jeans. Blue Lee Cooper W30" L34". Front rise 12.5". back rise 14". inseam 36". Straight leg. front rise 12". back rise 14". color : dark indigo. Right rear pocket has small place with missing stitching (see last pic). See last pic. Could be worn by him or her (depending on your style). I see no contents or size label. Inseam (crotch seam to bottom of leg) is 28". Crazy nice Lee jeans from the late 70's. These were washed and worn, but not enough to do anything other than break them in. Would made a very nice addition to any collection. the Lee mirror rivets.